“Game changer” has become an overused buzz term. Every innovation or advancement is either a definite game changer, or at least a possible a game changer. But the fact is, the “game” (and by game, I think we’re loosely referring to all of science, if not all of life itself) changes all the time no matter what, though admittedly certain inventions, such as the internet, could be credited with catalyzing particularly significant shifts. Most often, it takes hindsight to accurately identify such innovations, so lofting that descriptor at the outset can prompt skepticism. 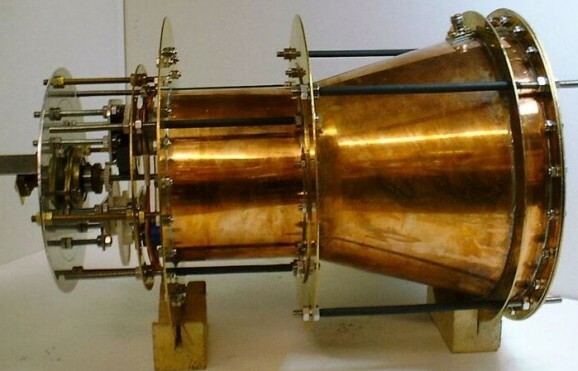 That said, I’m always on the lookout for advancements that might indeed prove to be major breakthroughs, and NASA just verified one: a microwave-powered, propellant-less thruster. What they’re alluding to at the end there is that perhaps the drive interacts with particles and anti-particles which seem to spontaneously appear and disappear. Right now, quantum vacuum plasma thrusters (Q-thrusters) are only theoretical, but highly desirable given that propellant wouldn’t be necessary and the fluctuations of the quantum vacuum would provide sufficient propulsion force. NASA estimates that if such a thruster could be created, it could get a spacecraft to Proxima Centauri, the next star closest to us, about 4.24 light years from the sun, in 30 years. It could also trim the time of a Mars mission from months to weeks. But even NASA is hedging its bets. In its published verification they focus on the testing and the results, rather than “address[ing]“the physics of the quantum vacuum plasma thruster.” Other scientists and agencies will undoubtedly scrutinize these results and try to replicate them. Fetta’s drive isn’t the first to make this claim. 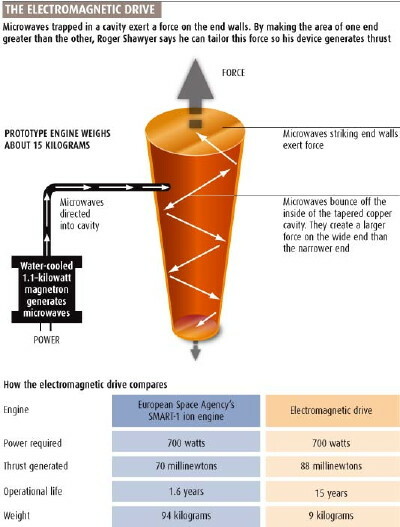 A British scientist named Roger Shawyer came up with something he calls the EmDrive, a similarly propellant-free propulsion system that uses microwaves to “convert electrical energy into thrust.” Skeptics have been vocal, but last year a research team from China built their own EmDrive and confirmed that it produces enough power to launch a satellite. Only now, in the context of NASA’s results, are people starting to realize that maybe Shawyer was onto something—perhaps even a game changer. “Most often, it takes hindsight to accurately identify such innovations…” A machine that can foresee hindsight would be a real gamechanger.